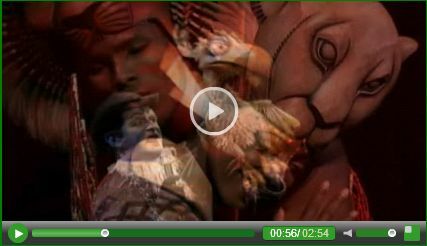 Ahhhhh Weema Wop Ah Weema Wop�The Lion King's music is iconic and uplifting and has been a part of American culture since the 1994 Disney animated feature stole hearts worldwide. Simba, Scar, Mufasa, Timon and Pumbaa worked their ways into our hearts and into the wallets of Disney executives. 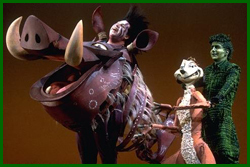 Since 1997, The Lion King The Musical has been playing to packed houses worldwide with sell out shows stretching for months on end. In short my friends, the Lion King is a sensation and you really shouldn't miss it while it's in Las Vegas. 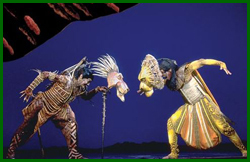 After all, with movie, Disney on Ice and now stage incarnations of the beloved tale, we're pretty sure the only venue that serves liquor during the Lion King is the Mandalay Bay, home to The Lion King The Musical. If you're asking yourself how The Lion King translates from animation to the stage, you're not alone. It does not seem a natural transition, after all, there are no humans in the story. With gorgeous, creative costuming, puppetry and superb staging and acting, audiences do not doubt for one minute that they aren't witnessing two lion cubs playing, or a mean old lion terrorizing a hyena. The stage design and costuming are a bit surreal, to be sure. But that is why it works. Much like Cirque du Soliel, the Lion King makes you believe through the power of suggestion. Audiences for years, have sung the praises of this production, why should Vegas be any different? The Lion King Las Vegas sweeps the audience away on a journey from many different angles. 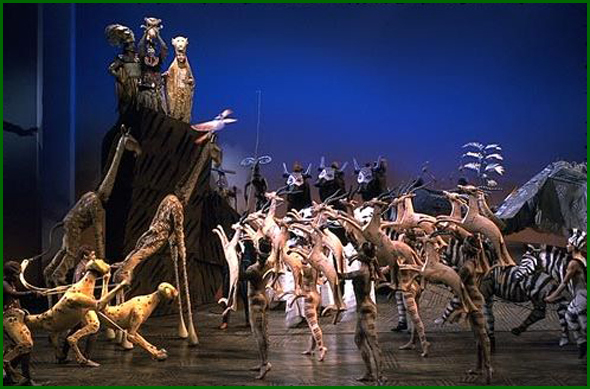 The lush scenery created by the production designers, the incredible costumes and puppets and makeup, the music, the stage direction � it is all an assault on your senses that sweeps you away to the African plains as Simba learns what it means to be a lion of integrity like his father Mufasa. The Lion King is a two act show with a full intermission and clocks in at right around 120 minutes. Folks, this is worth every minute and is a fantastic way to spend a night in Las Vegas � whether you're a group of adults or a mixed group with teens and even kids in tow. Let exploringlasvegas.com create a magical evening for your group with either a pre or post show dinner, transportation and tickets to The Lion King at Mandalay Bay and whatever late night entertainment whets your appetite. Just drop us an email or give us a call and we'll take care of all the details. Lion King Las Vegas show image. Watched the Lion King Show in Las Vegas ? Please share your experience with others. My family and I saw the new Las Vegas production of Disney's "The Lion King" this past weekend (July 25) at Mandalay Bay. I have seen productions in NYC and LA and was excited to see the how the Vegas production compared. While the beauty and vivid colors of the costumes and sets remain intact, I was quite disappointed at some of the trimming that has taken place for this production (unnecessary, in my opinion). "The Morning Report" has been cut completely - this is such a bright, fun piece with especially clever lyrics. It made no sense to me to cut it unless the guy playing Zazu is completely inept at singing, and even then he could easily get away with speak-singing (like Rex Harrison did in "My Fair Lady"). "Can You Feel the Love Tonight" was also noticeably pared down - no more of the aerial acrobatics and extended instrumentation. I kept hearing in the advertising that this production was bigger and better with the larger stage and theater, and I expected a bit of the typical Vegas grandeur (i.e. "Phantom - the Vegas Experience"). It didn't happen. If anything needs cutting, it's a lot of the Scar/Hyenas business. Overall, I love "The Lion King," but I won't be recommending the Las Vegas production to anyone I know - I would only see it in Vegas if I had no other options. My twelve year old granddaughter and I were enchanted by the costumes and production of the Lion King play in Vegas. Live theatre should mesmerize us and be magical as my granddaughter says, and the Lion King lives up to all of our expectations. We want to see it again soon. I completely agree with the other review. I have seen Lion King in London, Chicago, as well as Milwaukee and Appleton, WI. All shows had the aerialists for Can you feel the Love tonight. The aerialists performance in that song is what makes it beautiful and breathtaking. I cannot understand why Vegas of all places did not include them when they have about 7 Cirque shows that have aerialists. I was extremely disappointed and felt that I did not get what I paid for. I also agree that if you have to cut something, Scar and the hyenas would be a good choice. I will not recommend the Lion King Vegas to anyone either. It's not a complete performance. Very sad as I am an avid fan. The show itself gets 5 stars. The Vegas production gets 3.5. If you haven't seen The Lion King on stage, I highly, highly recommend doing so - but if you have the choice, see the national tour production. The Vegas production, while still excellent, cuts some beautiful parts out of the show (the dance sequence from "Can You Feel The Love Tonight" was one of my favorite parts of the show, and I was shocked to see it completely removed from this production). While I still enjoyed the show, I'd expected the grandeur Vegas is known for. The fact that this is the biggest stage this show's ever been performed on should have opened the way for it to be even more elaborate and beautiful; the cuts hurt the show. I suppose if you don't know what you're missing, it might still be a 5-star show; however, having seen the show before, this was definitely an inferior production. This version of Lion King was IMHO extremely disappointing. I would discourage people from attending this particular show & make them aware that much of the original story line and most of the well known muic just doesn't make it into the show. Why? Glad I got discount tickets as would feel sick if I'd paid full price for such a disappointing waste of time. National Tour has cuts too!